This collection of engraved illustrations of constellations is the second edition of German astronomer Johann Bayer’s (1572-1625) classic work. 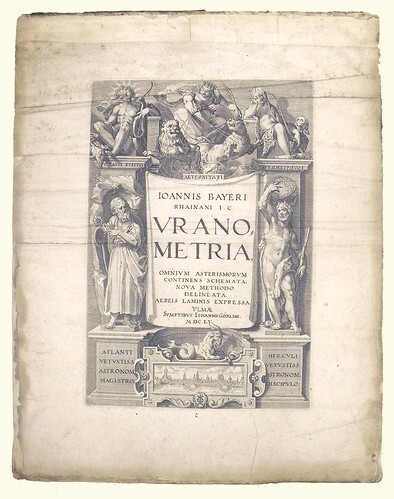 The first edition, published in 1603, contained corresponding tables which specified a star’s locations in the constellation, but these are absent here. The Uranometria was instrumental in standardizing the way constellations and orders of stars were denoted. Bayer’s engravings were highly original in their depictions of mythological figures and also very influential on subsequent star atlases. On top of the conventional constellations, Bayer recorded twelve new asterisms - groupings of stars which are not officially recognised as constellations. Image: engraved title page, featuring Atlas, Apollo, Hercules, Cybele, Diana and Capricorn.